Walking to the bathroom just before dawn, I find that my tender right knee shows none of the balkiness and cramping from yesterday’s ride. With 113 kilometres (~70 miles) of biking today, I can do the math: we have eight give-or-take hours in the bicycle saddle and I need two good knees. 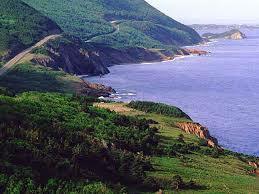 Fortunately we have none of the steep mountains of the Cape Breton Highlands National Park today. With my panniers lined with plastic to protect my clothes from the forecasted drizzle (Hannah’s yellow panniers are waterproof), we have overcast skies after two sunny days in the 70s. Relieved that our monster day through the mountains is over, we know that a long day in the saddle this Wednesday means we have only 30 some kilometres of biking tomorrow. 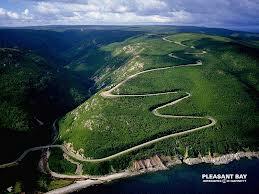 How do we pass the time riding side by side on the Cabot Trail for hours on end? We search for meaty topics and dive in. Today we talk about what we want when in conversation with others. Often conversations begin with the sharing of information. Clearly, that can be an important prelude to meaningful dialogue. What takes conversation to the next level is the back-and-forthness of genuine interest and curiosity. Thankfully, the distraction of this conversation takes us kilometres down the Cabot Trail. By noon, we arrive in Ingonish but sadly learn that there is no Coop grocery store in town for salads and fruit for our lunch. Buying two bananas for a dollar, we split one and head for Cape Smokey Mountain; we’ll lunch on peanut butter on bagels and last night’s pizza once we find a picnic table. At North Bay, we pass Ski Cape Smokey Mountain, which should have been our first clue that this part of the ride will be no walk in the park. Though the guide says we have 5% grade over three kilometres, we take the guide with a barrel of salt since it has erred before on its calculations of the grades of mountains in the Cape Breton Highlands National Park; we will soon learn that it has erred again. We climb and climb some more. It’s a persistent, unrelenting climb on a cloudy, overcast day. 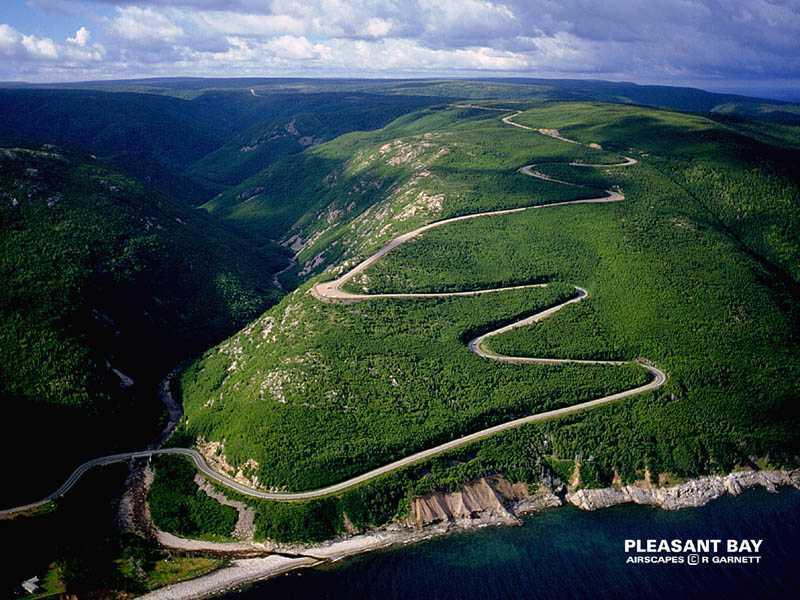 Out of nowhere we have another major climb, albeit slow and steady; but unexpected on a day when we thought our biggest challenges would be just pedaling 70 miles along the east coast of Cape Breton. With no place for lunch on the side of the road, we bike on for the next hour. At the summit, we find a picnic area atop of old Cape Smokey after what I am guessing has been a relentless climb of 12 to 15 kilometres. Cycling in on the gravel road to the picnic tables, we have been on the road for nearly six hours with miles to go before we sleep. While the greying overcast looms, Wally and Phyllis from the States welcome us over to lunch with them. Over the next hour, we learn that Wally and Phyllis are the daily double of friendship: they are interesting and interested. A winning combination in couples. We connect immediately over the joys and challenges of raising children, biking throughout the Northeast and Canada, our life journeys, and eventually learn they have a child with leukemia, as did we. Interestingly, how when you feel safe with others and there is mutual interest, these stories of the heart come out. We hug them good-bye as if we are old friends. While they drive off, we know that we still have three hours of biking til we arrive at Pamela’s B&B in St. Ann’s. 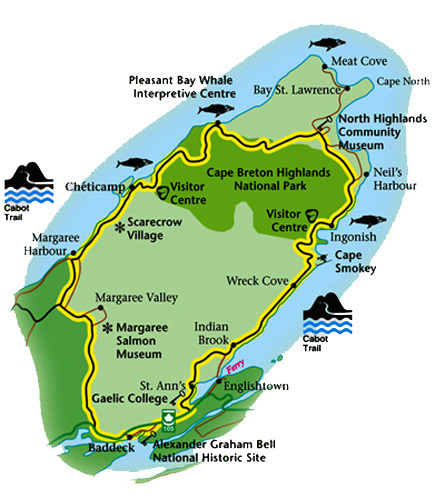 The descent of Cape Smokey Mountain to Wreck Cove (ominous name indeed?) is something out of downhill racer. Braking most of the time, we descend the mountain in less than five minutes when it took us more than an hour to climb the other side. Our rain gear comes out. The showery rain goes from drizzle to serious rain and back to showers. Without roadside kilometre signs, we have no idea how far we have gone, but every pedal gets us one meter closer to our night’s B&B. Beyond the point of wanting to take pictures with my iPhone, we pass the occasional farm house and craft shop, but our focus is the rain spitting road ahead. Told by Pamela that we will turn at a long white church, we think it’s got to be close since we have pedaled for two hours since our Cape Smokey picnic. Finding it, I dismount and walk to the door of the church with my right knee cramping and barking. No one is about, and I hobble back to my bike and painfully remount. I will pay for having dismounted. When looking back down the road from where we have come, we see a sign that indicates we have come 91 kms from Cape North. 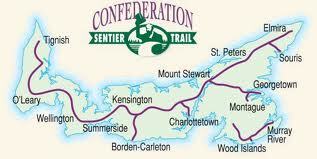 Doing the simple math, we calculate that we still have 22 kilometres (~ 14 miles) to go. Crushed and dispirited, I was hoping we were so much closer. The pain shoots up and down my right leg and hovers around my knee; I say to Hannah I can’t go on. You go ahead. She suggests I get back on the bike and see what happens. I say, Please ride ahead and have Pamela come back to get me. Hannah pedals on and I give it a shot and put my feet in my toe clips and let the left leg carry the load. Fortunately, I find it easier to bike than walk. The rain having stopped, I decide to pedal as far as I can until I can go no more. The faster I go the less painful my right knee is. So I go for it. In minutes, I race pass Hannah hoping to just make it as close to Pamela’s as I can before keeling over. My right knee/leg cramp doesn’t allow me to pedal on the downhills, but it goes along for the ride when my left leg takes on the hills. Having no idea where Pamela’s is, I make it the ride of my life. One pedal after another. And then, as life deals me good cards again, I spot the Pamela’s B&B sign some 8 kilometres (~5 miles) this side of the village center of St. Ann’s. My thirty minutes of bent-on-hell biking gets me to the uphill driveway leading to Pamela’s. Limping, I am greeted by Pamela and Donald. Parking my bike under the wood pile tree, I wait for Hannah, who will arrive ten minutes later. I can’t believe I made it – that we made it! Thankfully I won’t have to get on the bike for another 15 hours after biking 106 kilometres over the last eight hours. We are so fortunate the rain held off til after our ski slope descent of Cape Smokey; so fortuante that Pamela’s was on this side of St. Ann’s; and so very thankful that we only have 34 kms tomorrow to Baddeck to complete the Cabot Trail. After warm showers, we toast our good fortune in the B&B living room, and feel like we have basically finished the ride with 90% of the 300 kilometres of the Cabot Trail in the books. We do await what surprises lie ahead tomorrow- our last day on the road. We don’t sleep well. With the serious mountains of the Cape Breton Highlands National Park looming, we wake before 5A as dawn streams in around the shades this third of June. Uncertainty lies before us. We have no idea what to expect and have little choice but to pedal on into the mountains as our Hyundai Elantra is 60 miles back in Baddeck. We like to think we are resourceful in the face of such physical challenges. Well, let’s just see if we can walk the walk? I slice up pancakes for breakfast while Hannah gets her bacon fix with eggs over hard. Packed and pedaling down the Cabot Trail through Cheticamp, an Acadian town of 3500, Hannah in her biking tights and two jackets and I in my biking shorts and sweatshirt, see the distant mountains and wonder what lies ahead. At the visitor center thirty minutes later, we pay $6.80 each as seniors to learn what obstacles we will turn into opportunities. After the wife of an older couple takes our picture at the park entrance, he says, I was born on this spot. You got to have a good heart [to bike these roads]. It turns out I find comfort in his words since good hearts are what we have after exercising at the gym all winter long. Now let’s see how our mountain climbing legs measure up. 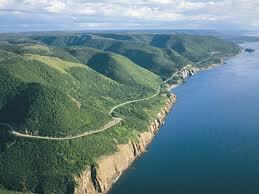 Nicely paved, the roads lead us along the rolling coastal hills above the Gulf of St. Lawrence. Told the first climb is the steepest but shortest at a kilometre with a 15% grade, we await its arrival as we pedal on. Before we know it, we shift to a low gear as I follow Hannah up the steep cliffside. Head down, aware of every inch of the pavement beneath me, I focus on one pedal at a time. And voila, we are at the top. That wasn’t so bad. What’s the big deal? we think. Of course, that was the baby brother of French and North Mountains. Still, one down, two to go. After cruising down the other side of this first climb, we see the ribbon of highway (thank you Woody Guthrie for that image) ahead of us. French Mountain is to our right, the sea to our left, but it doesn’t seem overwhelming at first glance. Are we missing something? After fifteen minutes of climbing, we stop to take in the coastline at a parking area vista. Easily remounting our bikes, we take the S curves on the side of the mountain and think, An eight per cent grade doesn’t seem so bad. A photo op by the snow patch provides us with another break, but we are not yet winded or heavy-legged. It’s actually kind of cool scaling this mountain on bikes. Few cars pass us this preseason late spring day; the ones that do, give us a wide berth. Spotting the French Mountain sign at the top, we are feeling, quite literally, on top of the world having biked for some 50 minutes. Checking the roadside sign we are stunned to learn that our climb of six kilometres (nearly four miles) with an 8% grade really has been a climb up an 11% grade. Well, that’s very cool. Two down, one to go. It turns out French Mountain was steeper than we thought. Flat highland biking restores our energy and refreshes our legs. Taking a break at the overlook to the Gulf of St. Lawrence on MacKenzie Mountain, we fortunately only have to descend this monster of a mountain. At 25-30 mph, we sail down towards Pleasant Bay on dry pavement that has me braking 70% of the time. A local café waitress cheerfully allows us to fill our water bottles on this day of full sun in the mid 70s. Having taken four hours of steady biking to go 26 miles, we are not breaking any land speed records at 6.5 mph. On the plus side, we have just 18 miles to go. On the flip side, North Mountain stands between us and our B&B in Cape North. The advertised picnic area mocks us. It is in the woods down an embankment near a creek that has a summer long mosquito and black fly convention in progress. Driven away, we finish our peanut butter and jelly sandwiches sitting in the gravel at the side of the road. Right now food is fuel; it’s energy for our bodily machines. North Mountain is right there, staring us in the face. We are at the feet of the monster with our bikes of 21 gears ready to attack. There is no prelude, no preamble to North Mountain as the climb begins immediately; we press hard on our pedals to climb the steep esses of the road. Already, we are in for the battle of our lives. Going so slowly, we feel like our bikes would fall over or tip backwards at any moment if we go any slower. I with a tender right knee and Hannah with a surgically repaired left leg push and push the pedals some more with power and conviction and hope. To maintain her focus, Hannah spells out her grandsons’ names with each pedal stroke – O-W-E-N, M-A-X-W-E-L-L – on her climb to the top. At the one kilometre mark, with three kilometres to go, the task is daunting. We are wavering; doubt creeps into our minds if we can really make it to the top at all. We continue to pedal so slowly, and the mountain top is nowhere in sight. And then, we have no more to give! We dismount, grab the handlebars with the left hand, push on the seat with the right, and plod up the mountain. We have no choice. North Mountain is kicking our butts and taking no prisoners. In five minutes, we remount but pedal for just a few hundred yards before we dismount again. Still unbowed and unbloodied, we press on for the summit. Again, the climb is steeper than we were told. After three kilometres we arrive at a plateau and resaddle our bikes. This has been the hardest physical test either of us has ever taken. Arriving at the summit ten minutes later, we learn that the incline has been 13% not the advertised 10%. Though we have been manhandled by the mountain, we still have 20 kilometres to our B&B in Cape North. Though Hannah’s left leg is fine, my right knee is tender and cramping. Pedaling high above the Aspy River, I favor my left leg as the right is aching and just along for the ride. I have little choice but to pedal on, however painful, for the next hour to Cape North. The headwind from the north doesn’t make it any easier as the temperature drops 20 degrees to 50F. Once in tee shirts, we are now bundled with jackets and sweatshirts. With nothing left to give, I focus on one pedal at a time. It’s a long slog to the Country Haven B&B, but the innkeepers Kathleen and Alfred take us in; a shower soothes me from top to bottom. After thirty minutes lying in bed, we uncork the bottle of Pinot Noir we brought over the mountain. Sitting in their living room in triumph, Hannah repeats three or four times, I can’t believe we did it. We have slayed the beast. Feeling well enough to walk the 100 yards down the hill to Angie’s Restaurant for a fantastic 18” veggie pizza, we meet up again with the six women from Saskatoon. One tells me gleefully that she had no intention of biking up North Mountain and just started walking her bike up. A maintenance truck approached her and the driver asked how are you doing to which she responded, it’s a struggle. Are you in distress, he asked? No, it’s just a struggle. Well, only if you are in distress, can I take you and your bike to the top of North Mountain. I am in distress! she agreed and got the ride of her life. Our monster day is in the books and now our big mileage day of 113 kilometres (nearly 70 miles) looms tomorrow. We wonder what the 100 miles of biking over the last two days will mean to these bodies of ours. After two fantastic days of warm and sunny weather, drizzle is in the forecast. Still with the monster mountains behind us, it feels like it is all downhill. We sleep well, but we couldn’t be more wrong about what lies ahead. 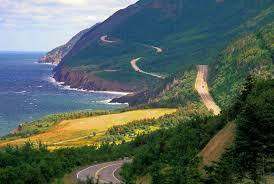 In Cape Breton, Nova Scotia, the Cabot Trail is a hilly, sometimes mountainous 300 kilometres (~190 miles) of paved road, much of it along the Gulf of St. Lawrence and the Atlantic Ocean. It has character, personality, and highlands (read: mountains) with climbs with a 15% grade. Though this is no walk in the park, Hannah and I have been thinking of biking this loop trail since we completed the Confederation Trail in PEI (Prince Edward Island) in 2013. We are ready to find out if were up to the test. Leaving early Saturday morning on the last day of May, Hannah and I drive north on the Maine Turnpike for Baddeck, Nova Scotia, the starting and ending point of the Cabot Trail. 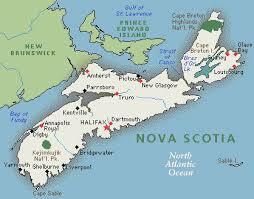 It will take us two days to drive the 730 miles to this northern Maritime province. Stopping at the Mount Katahdin viewing area on I-95 north of Bangor, Maine, we see the northern terminus of the Appalachian Trail for the first time. Usually the mountain is covered in clouds and hidden from our view. Some might see this as a good sign. Renewed and energized by a night in Fredericton, New Brunswick with our longtime friends Bill and Karen, we weave our way along the Trans-Canada Highway through New Brunswick and Nova Scotia. What does it take to climb 10 to 15% grades for kilometres on end when we have never done it before? Have our three to five minute climbs up the Bog Road and Fall Mill Road Extension hills here in York, Maine prepared us? We shall see. Over breakfast at the Baddeck Riverside B & B in Cape Breton on Monday morning, Laverne (the innkeeper) rustles up eggs Benedict (she picks spinach from her garden as we watch) to satisfy our hunger and energy needs. Soon we are cracking to go. Today we have 94 kilometres (~60 miles) of biking to the Acadian seacoast town of Cheticamp (pronounced Shetty-camp) in what is described as moderate biking conditions. Biking six kilometres from our B&B, we turn south on the Cabot Trail on the Trans-Canada Highway, our pavement home for the next four days. Over the first kilometres of rolling hills, we pedal steadily up the inclines. But no big deal. As we will have reinforced over the next four days, Canadian drivers move over without fail to give us our space as we ride. In our experience, Canadians have a richly deserved reputation for being just so damn thoughtful. Ten kilometres down the Trans-Canada Highway, we make a right turn inland onto a country road with no shoulders towards the Gulf of St. Lawrence. As I will for 97% of our ride, I pull up beside Hannah so we can talk as we ride side by side. It’s the first week of June, two to three weeks before the tourists descend on this vacation island, so we have the roads to ourselves for the most part. There will be stretches where no vehicle passes us for five to ten minutes. Riding in a clockwise direction on this loop trail, we take advantage of the prevailing winds and, as we will learn later, avoid the steepest climbs on the trail. Within the first hour we have our first climb to the top of Hunter Mountain. It’s a 5% grade for two kilometres which requires steady pedaling in lower gears. It turns out to be very doable and our confidence builds. Zipping down the other side, Hannah leans over her handle bars and rockets down the hill. A little less steady and less confident, I sit tall in the bike saddle to let the wind resistance slow my rapid descent. In tee-shirts and shorts, for the next two hours, we pass fields with gently rolling hills along the Margaree River Valley and think biking this Cabot Trail is not so tough. On the straight-aways, we can pedal up to 15 mph. Anyone fit enough can handle this ride, we say out loud to ourselves. Just after noon, we arrive on the seacoast at Belle Cote. As we enter this coastal town of modest houses and vacation homes, we are passed by the only other Cabot Trail bicyclists we will see during our four day ride. Six thirty-something women from Saskatoon, Saskatchewan are biking the Trail (as the locals refer to it). We will meet these moms and longtime friends tomorrow after we bike the mountains of the Cape Breton Highlands National Park. Arriving at our evening motel, the L’Auberge Doucet Inn high above the Cabot Trail in Cheticamp at 230P, we feel ready for another hour or two on the bikes. Alas, there is no place to stay the night further down the road since the Cape Breton Highlands National Park is just outside of town. Thanks to Hannah’s innate sweetness, the innkeeper upgrades our room to one with a king bed. With time to explore Cheticamp, we find a bottle of Shiraz for our late afternoon of wine togetherness. We pick up a Pinto Noir for tomorrow night after our ride through the highlands. Stopping by Velo Max Cycling, the one bike shop in Cape Breton, we are both sobered and encouraged by our conversation with Andre, the bike store owner. He tells us that just inside the park there is a 15% grade climb over a kilometre long. Then there is French Mountain at 8% grade over six kilometres. Finally the granddaddy climb of North Mountain has a 10% grade over four kilometres. 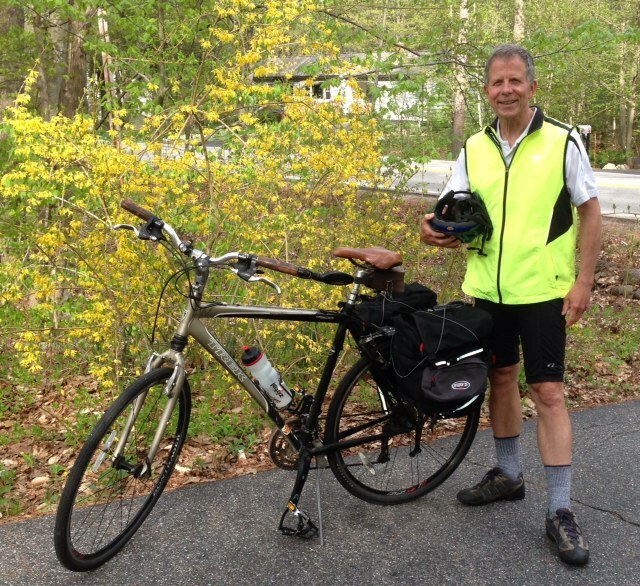 As an experienced bicyclist himself, he stands to pedal up North Mountain. This must be some bad mountain. He warns us of false flats, where the road seems level, but it is a climb nonetheless. Throughout our twenty minutes together, he says at separate times, you can do it and I don’t want to scare you. When someone says they don’t want to scare you, they have planted the seeds to scare you. Have we trained enough? Where could we have found such long, steep mountains to climb near our home in York, Maine? Are highlands really mountains? Having already done nearly 60 miles today, we wonder how our bodies will react to an even tougher day on the bikes tomorrow. Under 70F skies at 5P we sip a glass of Shiraz with our popcorn. Dinner comes from the local Coop; potato salad over mixed greens with bran muffins for dessert. We are reminded of Alaska by the sunset after 9P in these parts. But the late sunset is not the reason we won’t sleep well tonight. 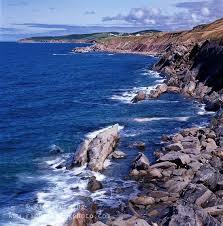 Day 2 through the mountains of the Cape Breton Highlands National Park awaits.